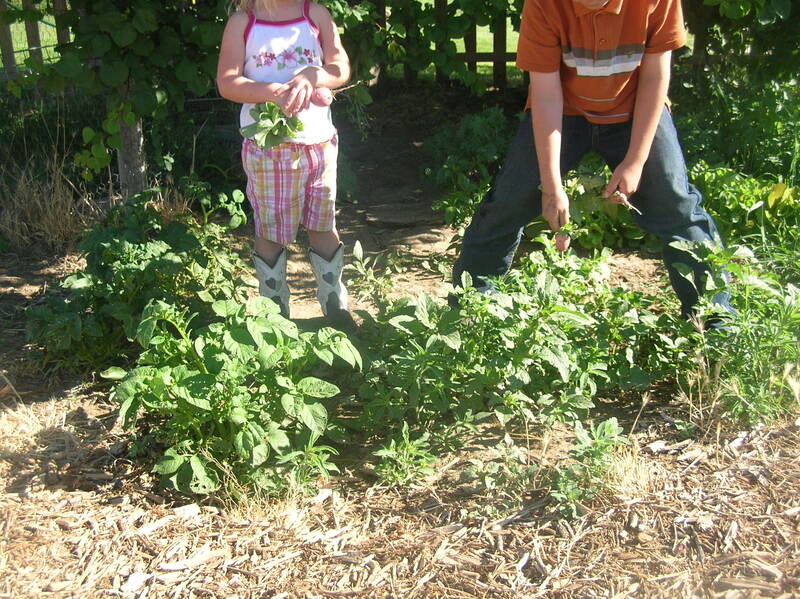 The attraction between kids and the soil just fascinates me. It’s like there is some higher power that pulls kids to that space of earth where there is no lawn growing and there is bare soil showing, like the natural attraction there is between cats and a sandbox. They just can’t resist the urge to get their hands dirty, digging, flinging dirt all over themselves and anyone near by, probably eating a little too. 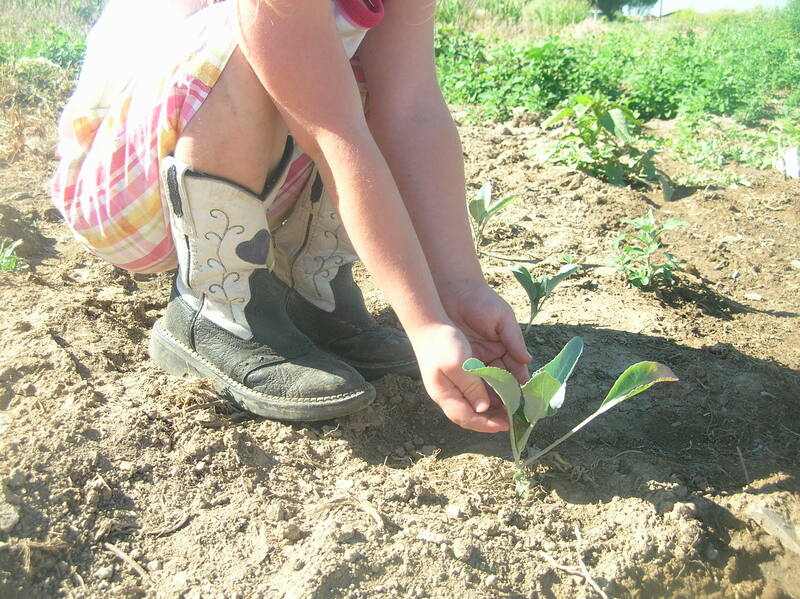 Our kids have always been interest in all the work going on in the garden or maybe it was just that urge to cover themselves in dirt at a young age, but they now show a real interest in growing food. I’m actually surprised that we haven’t plugged any pipes with a buildup of dirt from all the baths to wash off all the gardening and dirt digging fun off the kids. It is a regular occasion to bathe the kids during the summer and have the tub lined with dirt when the water is drained. We have said more than once that our kids are like chickens, they have to take their dirt bath or dust themselves daily! They were all drawn to dirt at a young age and still love it. And now that our gardens have become fields there is a lot for them to be involved in. They get to do more than just dig and smear it all over themselves. And they want to be more than just involved in all we are planting, weeding, tending, and harvesting. They want their own garden space and they have it now. It has been amazing to watch them plant seeds in their own arrangements or designs, carefully and diligently weeding, watch it all sprout and grow into seedling. Then get excited to harvest the fruits or vegetables of their labor. Life is so thrilling! Farm boy loves all aspects of it. And others like farm girl gets excited talking about gardening, but not so enthusiastic to actually do the work tending a garden. Our little farm princess loves to be involved and once again loves the dirt, but doesn’t have the attention span to tend a garden of her own yet. She is always there helping everyone else though, even if that means hoeing out the vegetables or watering the driveway and then yelling when someone step on her imaginary plants.. She’s helping, she’s dirty and she’s happy! So give your kids a garden to create, grow and eat or at least a piece of dirt to dust themselves in. You’ll be amazed at what they can grow. And how they grow and learn with it. It doesn’t matter if they are proud of just that one plant or even if it is just weeds that they grow, lots of them are edible too! Happy gardening and growing!